Information Technology synthesises the convergence of previously distinct and separate technologies. As is clear from Figure-1 below, developments in computer technology, electronic components technology and the communications technology along with appropriate software have converged and are now known by the catchword Information Technology' (IT). Information Technology refers to `a very wide range of elements which are utilised to create, transfer, transform and convey information through means, irrespective of whether these elements are in the form of equipment, services or know-how'. Developments in information technology have already produced vast gains in productivity resulting in counter inflationary trends in prices as well as substantial improvements in technical performance of many products and services. 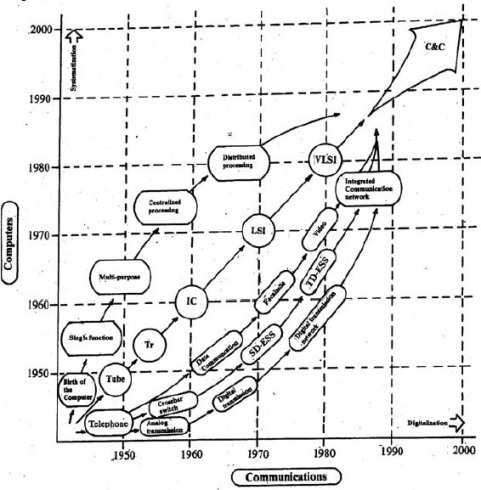 Source : Kobayashi, Koji, "The Japanese Telephone Industry in the Year 2000" in International Telecommunication Union (ITU), 3rd World Telecominunication Forum, Part 1, p. 11.6.4., ITU, Geneva, 1979. Information technology is all-pervasive as it affects all, activities that contain some form of logical function. The source of the activity could be mechanical, electrical, pneumatic, hydraulic or even intellectual. Information technology cuts horizontally across clerical, supervisory, managerial and communication activities, which are common to all sectors of industry and also affects the design of products and services, processes and organisations producing the same. We shall now discuss some of the major changes brought about by developments in information technology. Information technology brings about changes in products by replacing mechanical (e.g. watches), electromechanical (e.g. calculators) or older electrical or electronic (e.g. computers) parts or components, by upgrading traditional products by enhancing their capability. It includes functions involving, for example, logic and decision-making (auto focus in cameras) and even by creating entire new products (e.g., video games), smartphones, tablets, laptops. The product changes mentioned above have three major consequences. The first is that the value addition is transferred from the manufacture and assembly of parts to the production of the electronic assemblies/sub-assemblies with associated software as shown is Figure-2 for the telephone switching equipment as an example. Juxtaposed is the fact that the manufacture of electronic component based systems can have very low labour intensity (labour per unit of capital). 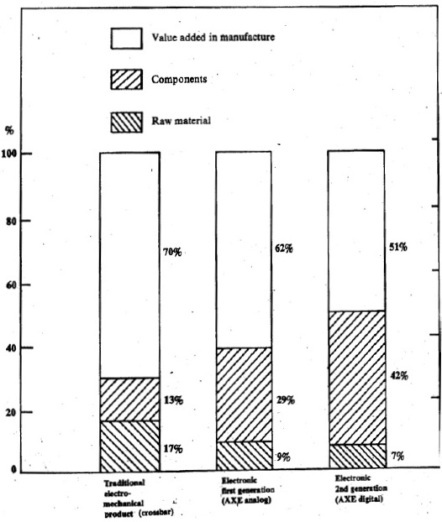 The picture that emerges suggests that the labour intensity of such products decreases with further 'consequences in terms of employment as well as location of the manufacturing plants. The second effect relates to shortening of product life cycles. Product design of many products get linked to developments in information technology in general and to developments in electronic technology in particular. Because there are very fast developments in these technologies, they have their effect on the design of newer products, thus shortening their product life cycles. As a convergence technology, IT acquires the ability to condition developments in an ever increasing number of sectors of the economy. The ability to create, store, retrieve, transfer, transform and convey information/data efficiently and economically (imparted to products by developments in information technology) allows the products to the integrated into larger systems so that the products are compatible with the larger systems for enhanced capability. For example, electronic-typewriters cannot only type but also store the, typed information for later processing on a microcomputer and so compatibility with microcomputers will be one more feature to be built into electronic typewriters. Stagnant Personal Services: These services require direct contact between the customer and the service provider. Since the quality of the service, to a great extent, depends upon the amount of time spent on services it 'is difficult to realise significant productivity gains in these services. For instance, hair cutting, teaching and counselling belong to this category. However, it is possible to realise significant gains in productivity in the supporting activities necessary for providing the service. For example, overhead projectors, photocopying facilities teaching aids, and computers have all contributed to a higher productivity of teachers. Substitutable Personal Services: These services also require direct personal contact but it is possible to substitute these services with technological alternatives. For example, guards can be substituted or helped by electronic security and serveillance equipment and domestic servants by a variety of household appliances like washing Machines, ovens, -mixers, etc. Information technology has played a big role in improving the productivity and the performance of this equipment substituting services. Centrally controlled computer devices or gadgets incorporating programming facilities have been developed to operate the domestic appliances in accordance with the consumers’ needs or desires. Progressive Services: These services require the use of some equipment and also direct personal contact with the receiver of the service. Technological change affects the productivity of the equipment more directly and significantly than the personnel offering the personal contact-based service. For example, air transportation requires the use of the airplane as well as that of the ground and cabin crew; and broadcasting requires the use of studio and transmitting equipment as well as the "personal" contact established by the broadcaster(s). In a way, there is some hardware and some software required to render the service and information technology is affecting the productivity of the hardware more than that of the software. Explosive Services: Services that do not require personal contact belong to this category such as telecommunications. Information technology is bringing about significant productivity increases in these services thereby reducing the unit cost and setting counter inflationary trends in prices. Developments in information technology are also contributing to the generation of new services in this category e.g., facsimile transmission (FAX), Videotext and Electronic Mail. The above classification helped us to understand the role of information technology on productivity improvements in services. It also brought out another major effect of information technology, viz., its contribution to the transportability of services. Many services, based on exchange and transformation of information, are becoming more and more transportable. This can be seen happening in some banking and retailing operations, stock market services as well as in services relating to development of software. Transportability of services has brought about at least three major effects in its wake. It has led to internationalization of services in many fields bringing out cross border flows of messages, information and data. Many of the services traditionally catering to local markets are now being offered to the global market. The second effect relates to changes in barriers to entry in services. In many services the barriers to entry are getting lower as the cost of entry is 'practically limited to the cost of equipment which itself is falling e.g., desktop publishing. On the other hand, the barriers to entry in some other services, where an integrated network of services is offered, are getting higher. This can be seen in some banking operations as well as development of software requiring satellite data transfers (since the cost involved in developing infrastructure is very high). Transportability of services has also increased the transparency of market due to widespread availability of information. The foreign exchange market and the money market have already affected by information technology. The Bombay Stock Exchange is being planned to be more transparent very 'soon. Being designated as National Stock Exchange, scripts of many international companies will be admitted and many Indian companies would be listed on the stock exchanges abroad. Information technology changes processes in two major ways: it allows the incorporation of higher levels of skills and functions into equipment (as in computer controlled machine tools and robots) and it increases the flexibility of many processes to achieve economies of scope involving almost continuous production of individualized products. This can be seen in Figure 3.7 below where different stages of manufacturing automation are plotted against volume and variety. 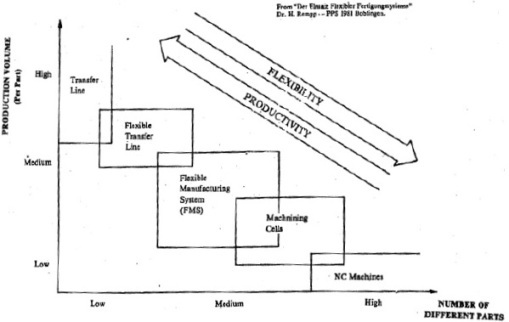 Process automation as the general characteristic of replacing direct labour (unskilled and semi-unskilled) with capital in conformity with the long-term shift in prices. Consequently, direct labour cost as a fraction of the product cost is declining. This phenomenon is wiping out the comparative advantage of developing countries in terms of low labour cost. Training and retraining of labour, including technicians / operators, has almost become a necessity in the existing enterprises. The second effect is the combination of lower labour cost with higher automation. Automation seems to be removing the primary reasons for locating assembly operations in off-shore locations. The cost of assembling semi-conductor devices in Hong Kong is lower than that of USA. So advantage for USA in terms of a lower labour cost in Hong Kong due to higher automation. The automated assembly process using the so-called "hands-off" approach also produces products of very high quality. Information technology enables the producers of process equipment to develop horizontal links with other products or equipment or services such as material handling, integrated process control, fabricators etc. It also helps the manufacturing process through better planning, coordination and control. For example, modern manufacturing resource planning enables management to plan and control all manufacturing resources-material, equipment, personnel, tools, etc. more effectively, thus improving the productivity of operations as well as releasing investments in inventory. It is now widely known that in Japanese enterprises inventories are operated on hourly basis, while in India and other developing countries inventories are still carried on monthly basis, which increases the over-all costs of operations and products. These changes also affect the skill-mix of personnel required for the changed process. As production processes become more sophisticated, the number of direct workers would perhaps show a decline whereas more engineers and technicians would be required to carry out reprogramming, installing, repairing and even developing newer processes. This would also call for extensive retraining at all levels, especially those skills, which are likely to become scarce. Information technology also allows higher integration of suppliers, vendors and subcontractors into the network of manufacturing companies. Specialist suppliers, in many cases, are better placed to adapt changes in products and processes and many large firms are finding it easier and more economical to "buy" than "make". In the case of many large manufacturers in developed countries, this has given rise to a hierarchical structure of subcontractors akin to the organisation structure (with the 'subcontractors being part of the extended organisation). Ancillarisation of large manufacturing units in India is a step in this direction. E-Commerce evolved as the latest integration model of manufacturer/ suppliers with marketers (Marketplace) to reach the customers through figure tips. Increased office automation, has not only improved office productivity substantially but has also made the coordination functions easier and more effective as human resources can be used and consulted in real time.